As the 2018 college football season gave us their soft opening with Week 0, we at PFF are excited to offer our readers some of the insights generated from our analytics group after an offseason of delving into our college football databases. The problem of rating and ranking teams, especially in college football, is one that has interested researchers for as long as the game has existed, and our group at PFF is no exception. 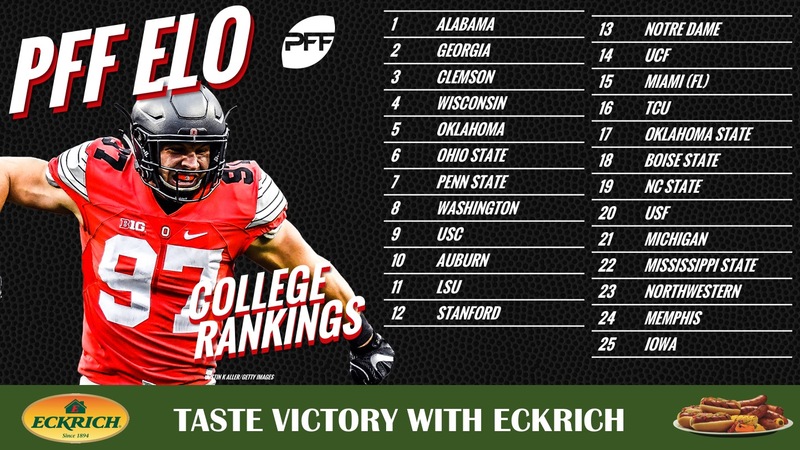 Below is the first installment of our weekly PFF ELO rankings for college football. Like all ELO systems (including our version for the NFL), PFF ELO is an iterative system that updates each team’s rating after each game based on two things: how well they played against their opponent and how well they were expected to play against their opponent. The PFF ELO rating system measures the former using our unique offensive, defensive and special teams grades, while the latter is determined by the PFF ELO ratings leading up to the game and where the game is played. For example, a heavy favorite playing at home is expected to outplay the visitor, so a victory would result in only a small rise in their PFF ELO rating and a similarly-small decrease in the defeated team’s rating. If an upset were to happen, the visiting team would see their PFF ELO rating rise substantially while the home team would see a similarly-sized drop. Sometimes in football, the best team does not win, and PFF ELO accounts for these oddities by using our grades. Hence there will be teams rated higher or lower in this system than their win-loss record would suggest. Since PFF began charting college football in 2014, the difference in PFF ELO values alone has been able to explain over three-fourths of the variance in the closing Vegas line. Check back to profootballfocus.com for weekly college spread picks using this model (as well as other information) and check out PFF Greenline for our NFL version of the product. Coming off a National Championship in 2017, Alabama had 12 players selected in the 2018 NFL Draft. This is the most in school history and second most all-time (Ohio State had 14 players drafted in 2004). A lot of talent walked out the door in Tuscaloosa, and especially on the defensive side of the ball. However, every year head coach Nick Saban successfully finds a way to replace NFL level talent, and 2018 should be no different. Quite possibly the toughest prediction to make is who will be the majority starter at quarterback. Most prognosticators assume Tua Tagovailoa will receive a significant increase in snaps after his performance in the National Championship game. His 144.7 passer rating when kept clean is encouraging, as clean pockets elicit the most-stable quarterback data at both the college and NFL level. The upside with Tagovailoa definitely exists but it may take him drastically reducing his negatively-graded throws. In 2018, Tua had 16.1 percent of dropbacks result in a negative grade compared to Jalen Hurts at 12.3 percent (eighth best in the FBS). The SEC is stacked again at the top with Georgia checking in at No. 2 in our initial rankings. Quarterback Jake Fromm posted the conference’s top passer rating on deep passes (20-plus yards) at 125.0 as he has shown he has NFL-level talent, yet still might not be able to hold off five-star recruit Justin Fields. RB D’Andre Swift had the 10th-highest yards after contact per attempt (4.38) among all running backs in 2017 and will be tasked with filling the void left by Nick Chubb and Sony Michel heading to the NFL. Swift should be up for the challenge as four of the five starting offensive linemen from a season ago are returning, and they should have initial success running the ball at will early on. Roquan Smiths’ departure to the NFL leaves a huge question mark in the middle of the field defensively. His coverage skills were elite (90.5) and could underline a glaring point of weakness for the Georgia defense in 2018. Clemson was the youngest participant in the 2017 College Football Playoff and they return a stellar cast of players hungry to improve on their third-place finish. Quarterback Kelly Bryant returns to power the Tigers offense. In 2017, he tied for the seventh-best completion percentage (73.9 percent) among quarterbacks returning in 2018 and first in the ACC. Whether he does enough downfield to hold off Trevor Lawrence for another year is a hot discussion point for Clemson fans. Security-blanket Hunter Renfrow returns and will continue to do most of his damage out of the slot after running 93.6 percent of his routes from an inside alignment in 2017. There is hype surrounding both Diondre Overton and Tee Higgins as game-breaking talents at receiver and they should both have the opportunity to contribute early. The offensive line received a significant boost when Mitch Hyatt (left tackle) decided to return for his senior season. He will anchor the offensive line with Tremayne Anchrum (right tackle) as both should continue to improve on their impressive pass blocking grades in 2017. Dexter Lawrence is definitely emerging into an elite defensive lineman with his 86.6 overall grade in 2017. Both Clelin Ferrell (73.2 pass-rush grade) and Christian Wilkins (77.9 overall grade), however, are simply above average according to their PFF grades, and not otherworldly as others have stated. Dorian O’Daniel is the only real loss to the Tigers defense with his coverage ability on tight ends and slot receivers. How well veteran Jalen Williams or Isaiah Simmons fill the void left by O’Daniel will be a key to this defensive unit maintaining their top ranking. The left-handed slinging Alex Hornibrook returns in what many hope will be a defining year for Wisconsin. His 8.82 average depth of throw on completions ranked eighth in the FBS for 2017 but this undoubtedly came with risk as his 14 turnover-worthy throws on 4.39 percent of his attempts ranked just 102nd in the nation. Wisconsin had success with RB Jonathan Taylor thundering through contact at 4.53 yards after contact per attempt, eighth best in the FBS. The Badgers return a stacked offensive line that should produce at least four linemen who will get drafted when eligible. We at PFF obviously believe passing is king, but we also know year-to-year success from play action isn’t the most stable metric. 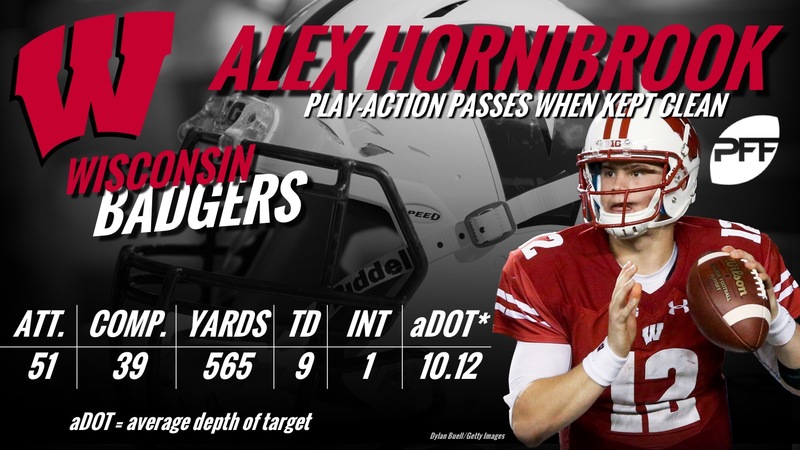 Badgers fans have to hope that play action while being kept clean is as Hornibrook had significant success in that situation in 2017 albeit on a relatively small sample size. The Badger secondary needs to replace their three highest-graded defensive backs in coverage from 2017 in Nick Nelson, Derrick Tindal and Natrell Jamerson. This will be a tough task, as the Badgers coverage defense on passing downs was first among the Power-5 teams with a passer rating allowed of 54.9. If the secondary is able to learn on the fly, the Badgers hopes of participating in the College Football Playoff seems more plausible with each passing day. With PFF’s No. 1 overall player Baker Mayfield departing from their roster, the questions surrounding the Sooners begin and end with the quarterback position. Kyler Murray is expected to take the reins of the Sooners offense. As a two-sport athlete (drafted No. 9 overall in the MLB draft) and one of the fastest players on the Sooners squad, most prognosticators expect a significant uptick in designed runs and run-pass options for the new-look Oklahoma offense. They do return their two most productive skill position players from 2017. WR Marquise Brown had a 135.5 passer rating when targeted (fifth overall in FBS) in 2017. RB Rodney Anderson also returns after taking the lead back responsibilities midway through the 2017 season. He was efficient on targets out of the backfield, posting a 1.59 yards per route run (19th in the FBS). The Sooners defense definitely was not their strong suit in 2017 yet they are still tasked with replacing their top two coverage defensive backs from 2017. Even with all of the question marks, the Sooners are still expected to win the Big 12 in what many are expecting to be a down year for the conference. Will that be enough to secure a spot in the College Football Playoff is an entirely different question. The Buckeyes program is reeling with head coach Urban Meyer slated to serve a three-game suspension to start the season. This sent them from third to sixth in our initial PFF ELO rankings. Ohio State heads into the 2018 campaign with Dwayne Haskins penciled in as the starting quarterback. In 167 total snaps in 2017, he had 65 dropbacks and completed 40 passes on 57 attempts. His playing time mainly came during mop-up duty, which does explain his low average depth of target (6.57 compared to J.T. Barrett’s 8.08). His nine negatively-graded throws (despite the low sample) are cause for concern, but he did perform well when kept clean, posting a passer rating of 118.4. Tate Martell provides game-breaking athleticism as a redshirt freshman and will be waiting in the wings if Haskins falters. Running back J.K. Dobbins (4.23 yards after contact per attempt) returns to spearhead the Buckeyes rushing offense. The Ohio State offensive line returns significant depth but will need to replace LT Jamarco Jones (87.0 overall grade). Parris Campbell leads a relatively deep group of wide receivers who will look to alleviate some of the pressure on Haskins. Nick Bosa will be an every-down edge player in 2018 and continue to cause nightmares for opposing quarterbacks after a 16.8 pass-rush productivity mark in 2017. He is the top rated player of the PFF College 50 after leading the nation with a 92.5 grade on 338 pass-rush snaps. Denzel Ward’s departure to the NFL leaves a gaping hole in coverage on the left side. How well they can shore up this position among the potential freshman options will go a long ways towards determining the success of the 2018 Buckeyes. The Big Ten is loaded this year as both the Wisconsin Badgers and Penn State Nittany Lions hope to challenge the Buckeyes at the top. QB Trace McSorley returns to Happy Valley in 2018 but may need name tags for all of the replacements he will have at the skill positions. This Penn State offense may just turn out to be a litmus test for how valuable a running back really is to a college offense. Cause for concern for McSorley is his low aDOT on completions at 6.50 and skeptics will look to this and say he was aided by the otherworldly talent of Saquon Barkley, which might be true. McSorley was middle of the road in the FBS with 49.7 percent of his total yards accounted for after the catch. With Barkley and Mike Gesicki now playing in the NFL, McSorley will need to adjust his preferred targets to take advantage of the athleticism Penn State has at the wide receiver position. McSorley did have the fifth-best passer rating when kept clean in 2017 at 125.4 so the fact that this is the second-highest among returning quarterbacks and also stable should be a source of excitement for Penn State faithful. Shareef Miller anchors the left side of the defensive line and was extremely effective at getting pressure on the quarterback last season, posting a pass-rush productivity of 15.4 in 2017. The loss of all four starters from the secondary will be significant, especially Grant Haley (85.0 coverage grade) and Troy Apke (82.9 coverage grade). Amani Oruwariye will provide leadership and experience to this unit after playing well (310 coverage snaps) as the nickel cornerback and with an above average pass coverage grade of 80.0. If this 2018 coverage unit can come close to last year’s 76.6 passer rating allowed, then Penn State could emerge as the favorite to sit atop the stacked Big 10 conference. The Washington Huskies lead USC by the slimmest of margins in our initial PFF ELO rankings to start 2018. The Pac-12 is hoping that a matchup of these two teams in the conference championship game serves as a play-in game for the college football playoff. Washington has an early advantage returning quarterback Jake Browning and his 117.5 passer rating when kept clean (fifth in FBS among returning quarterbacks). Dante Pettis leaving opens up a number of targets for other pass-catchers and the hope is that more athleticism on the outside will lead to explosive plays being generated. In 2017, the Huskies averaged 5.91 yards after the catch per completion which was 65th in the FBS. Chico McClatcher returns from an ankle injury with a two-year sample size of 3.46 yards per route run. The Huskies will hope that he can provide the big-play potential in the passing game as most of their explosive plays in 2017 came when targeting the tight end position. TE Hunter Bryant remains a question mark two months removed from knee surgery, as to when and to what capacity he returns is up in the air at this point. The Washington defense has one massive hole to fill in the middle with the loss of first-round interior defensive lineman Vita Vea. the outcome of games, so Vea’s loss is not as notable as many fear. The Huskies should be encouraged that they have CB Austin Joyner and S Taylor Rapp returning to lead the passing defense. This coverage unit was first in the Pac-12 with a 75.1 passer rating allowed in 2017. The hype coming out of Seattle seems real as the Huskies set their sights on returning to the College Football Playoff after taking a year off in 2017. The key difference in our initial Power Rankings of the two teams sitting atop the Pac-12 is Washington returning QB Jake Browning and USC announcing they’re going with five-star recruit J.T. Daniels at the helm. Before the three-headed battle for the starting quarterback spot came to an end, Daniels seemingly offered the most upside while redshirt freshman and four-star recruit Jack Sears provided more familiarity within Coach Clay Helton’s offense. Redshirt sophomore Matt Fink has the longest tenure in this USC offense and is the only quarterback on the roster who has thrown a pass in an actual game. Coach Helton decided to go with the true freshman, and he’ll have to rely on several returning players to anchor his offense as the young signal-caller gets his feet wet. Tyler Vaughns saw a 118.4 passer rating when targeted a season ago but he’ll have to improve on his 1.95 yards per route run which seem to paint a different picture. If he can improve on his low percentage of total yards coming after the catch at 29.38 percent, he could emerge as the playmaker this offense desperately needs. The offensive line returns four starters from 2017 and is the clear early strength of this offense. Ajene Harris, Marvell Tell and Iman Marshall return to lead a talented and deep defensive secondary. As a coverage unit in 2017, they had a 77.5 passer rating allowed. If they can improve on this coverage metric and the offense fulfills its potential, USC could find itself in the College Football Playoff discussion. The Auburn Tigers will find out early if they can compete again with the class of the SEC. After beating both Georgia and Alabama in 2017, Auburn stumbled down the stretch and wrapped up one of the more perplexing seasons in recent memory. They start off 2018 with a “neutral” site matchup against eighth-ranked Washington and later battle both Georgia and Alabama on the road. Jarrett Stidham had a middling 75.0 passing grade in 2017 and he relied heavily on his skill position players by having the 13th-highest percentage of yards after the catch, making up his total yards at 60.5 percent. He did flash many moments of being an elite college quarterback as evidenced by his 114.6 passer rating when kept clean and his 80.7 percent adjusted completion percentage when free of pressure was tied for second best in the nation. WR Ryan Davis stepped up down the stretch and played a significant role in Auburn’s win over Alabama in 2017. He had a 92.8 PFF receiving grade in that contest and if the end of the season is any indication, he should have a massive role in 2018. Derrick Brown (82.0 run-defense grade) and Dontavius Russell (83.8 run-defense grade) return to lead one of the most formidable defensive lines in the country. Most expect this secondary to take another significant step forward with Javaris Davis (82.9 pass coverage grade) and Jamel Dean (88.3 pass coverage grade) returning. If they can find an answer to their question at nickel cornerback, they should be able to improve on their 2017 passer rating allowed of 78.1. With one of the hardest schedules in college football, they will need to be dominant on both sides of the ball every week if they want to return to the College Football Playoff.